Rep. Elijah Cummings, D-Md., dropped a big bombshell on Wednesday in the Russia investigation when he revealed that Democrats on the House Oversight Committee had been sitting on some stunning information for months at the behest of special counsel Robert Mueller. Free to tell the story now that Michael Flynn had pleaded guilty to charges of lying to the FBI, Cummings said the committee Democrats had been approached last summer by a confidential whistle-blower. He or she reported having been at an inauguration party with a former business associate of Flynn's when that person received a text from Flynn during Donald Trump's inaugural address telling him that a mutual business deal was "good to go." The business deal in question is the one I wrote about last week, in which Flynn consulted with a company called ACU to build nuclear reactors throughout the Middle East. ACU is run by a man named Alex Copson, who has been promoting various projects to build nuclear facilities with Russian help for more than two decades. According to The Washington Post, "Russian interests would help build the plants, as well as possibly take possession of spent fuel that could be used to build a nuclear weapon." Cummings sent a letter to Rep.Trey Gowdy, chair of the Oversight Committee asking him to have the committee look into it (which Gowdy has refused to do). The letter says the whistle-blower reported that at the inauguration event Copson said it was "the best day of my life." That was because Flynn had assured Copson that the sanctions against Russia put in place by the Obama administration, which reportedly threatened the nuclear project, would be "ripped up" under President Trump. According to the whistle-blower, Copson said, "This is the start of something I have been working on for years. Mike has been putting everything in place for us." Copson allegedly turned his phone around when he received the text, displaying the message from Flynn that the project was "good to go." This would mean that Flynn's first action for the new president was to let his former business partners know that their plan to build nuclear reactors with Russian partners was on. Think about this for a moment. By this time, Flynn and everyone else in the country was aware that Russia had interfered in the election and that there was serious suspicion surrounding the Trump campaign's and transition team's dealings with Russian actors. They knew about the "Steele dossier" because it had been written up in Mother Jones before the election, and Trump himself had been briefed on it by FBI Director James Comey. If what this whistle-blower says is true, Flynn was even more reckless than we knew. Flynn has made the case in public that it's important to engage in business deals with Russian interests because the United States needs the Russian government to help fight ISIS. It's even possible that's what he thought he was doing -- along with lining up a fat payday. According to The Washington Post, Flynn pushed this plan relentlessly during his brief tenure in the White House as national security adviser and his staff kept pushing it even after he left, without really understanding why they were doing it, just knowing that Flynn insisted it was a high priority. 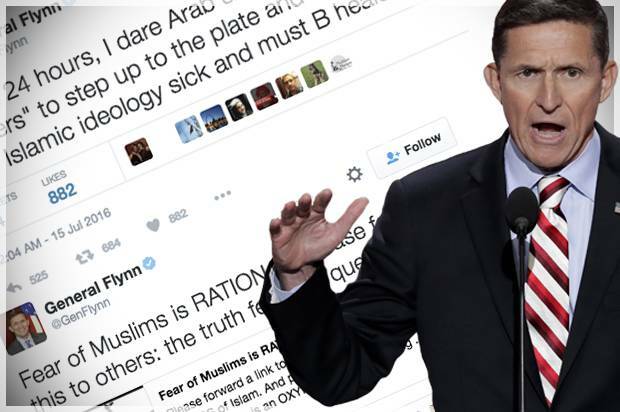 But even putting the most generous spin on these events, in which Flynn's rationale was simply to keep America safe from terrorists, does not get him off the hook -- nor does it excuse anyone else in the Trump administration. The Russian government interfered in the presidential election, and the incoming administration had an obligation to acknowledge that and pledge to prevent it in the future, regardless of their supposed desire for a U.S.-Russian alliance against ISIS. In any case, the idea that the Trump team were so intensely focused on Russia because they all shared the belief that Vladimir Putin's government was the key to American foreign policy across the globe is hard to believe, even from this inept crew. Trump was sucking up to Putin long before Flynn joined his entourage, and Flynn seems to have developed his odd preoccupation with Russia on his own as well. It's possible that they each, for different reasons we have not yet fathomed, came together around this common purpose. What has become clear in recent days is that both the Trump campaign and the Russian government were obsessed with the sanctions. The now-legendary Trump Tower meeting in June 2016 was about rolling back the Magnitsky Act, which created sanctions against Russian oligarchs. Trump ally Erik Prince admitted to meeting with a Russian banker in the Seychelles Islands on behalf of the Trump transition on the topic of -- you guessed it -- sanctions. When the Obama administration imposed sanctions on the Russians over the election interference, senior members of the Trump campaign told Flynn to get on the horn to assure Russian ambassador Sergey Kislyak that those sanctions would be withdrawn them after Trump took office. Now we have someone testifying that Flynn was texting his buddy on inauguration day that they were "good to go" -- on lifting those same sanctions. Members of the State Department and former Obama administration officials were so alarmed that they went to Congress to ask for action. Sen. Ben Cardin, D-Md., and Sen. Lindsey Graham, R-S.C., introduced legislation to bar the administration from granting sanctions relief without congressional review. That bill died when Flynn was fired shortly thereafter, but another one soon replaced it and became the only major bipartisan piece of legislation passed overwhelmingly by this Congress to date. Trump grudgingly signed it but only because there were more than enough votes to override a veto. The administration has apparently been very slow to comply with the law. We still don't know why Trump associates met with all those Russians during the campaign and the presidential transition. And we don't know whether the Russian government was holding something over Trump's head, or what that might have been. But it's clear what the Russians wanted in return for their help: They wanted those sanctions lifted. Although we don't know exactly why, it's also clear that the Trump team did everything in its power to get that done. Maybe it's all one big coincidence. But every day more evidence emerges that makes that harder to believe.